As a child Einstein had trouble speaking. Einstein would speak very slowly as he would form sentences in his head so he could speak them properly. It worried his parents so much that they thought he may have been mentally-handicapped. This fascinating Einstein book, Einstein's Tears, was written by a physicist and writer, Joseph Prindle. This Einstein book is dedicated to enthusing young people, and those who influence them, to learn about Einstein, science, and physics, while building public awareness about their benefical roles in society. In this poignant collection of stories, influential objects from Einstein's life weave their way through the fabric of space and time, becoming catalysts that transform people's lives. And once touched by Einstein - means forever changed. The name of Albert Einstein still evokes an exceptional fascination more than five decades after his death. In EINSTEIN?S TEARS, Mr. Prindle illuminates the world?s most famous scientist, revealing the captivating man through his contact with ordinary things. His watch teaches a rich man a short lesson about time travel, his violin transforms a bitter holocaust survivor, his compass guides a young woman to safety and his socks teaches a young boy what matters most. In the title story, struggling with the knowledge that his work will lead to the creation of an atomic bomb, Einstein sheds a tear, which makes its way through the years into the hands of a couple facing the most agonizing decision of their lives. Each story in this jubilantly acclaimed collection pays testament to the remarkable life of Albert Einstein. They will make you think, laugh, cry, and feel the touch of a genius. Written by a physicist with a life-long passion for Einstein, these stories bring him alive for the reader in a unique and inspirational way. 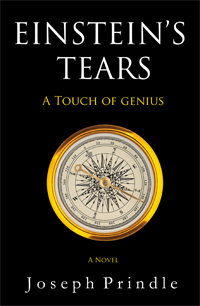 In this beautiful novel, EINSTEIN'S TEARS, with its relative yet keen insight into the human condition, Mr. Prindle shows us how Einstein?s touch has left concentric ripples on the arrow of time that continue to be deeply felt in our universe. Please visit other sections of our website to learn more about Albert Einstein, Albert Einstein books, Joseph C. Prindle, the Albert Einstein book 'Einstein's Tears' by Joseph Prindle and the eagerly awaited movie - A. Einstein. Or for more information about the Albert Einstein book or the movie A. Einstein, please email us at Albert Einstein Book or call us at 1-800-965-6875. If there are other Albert Einstein Books that you would like added to our list, please email us at Albert Einstein Book or call us at 1-800-965-6875. Thanks in advance! And remember - Einstein Rocks! "It has been become appallingly obvious that our technology has exceeded our humanity"